Our range of precision engineered electrical components is used in diverse industrial purposes. 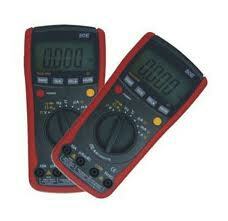 We deal in all types of Digital Multi Meters, amperes and allied components. These are perfect to be used in power lines and parallel instruments. The millimeters have a capacity of 0-400 amp on alternate and direct current. It is also provided with a clamp meter and operates on a voltage of 0-1000V ac or dc.